Singular-type Themer layouts that you create in Beaver Themer do not by default appear in the WordPress Template dropdown list on page or post editing screens. However, you can treat them like other WordPress page templates and add them to the Template dropdown list with a bit of PHP code. You can add the choice to pages only, single posts only, or both. In this example, we'll add a Singular Themer layout to the Template field for both posts and pages, as shown in the following screenshot. Once you've completed this procedure, you can choose the new template to change any single page or post. Note: The name in the Template field dropdown list comes from the information you add to a file in the following procedure. The Themer layout is related by its ID, not by its title. The Beaver Themer plugin is installed and activated. You have created a Singular-type layout in Beaver Themer. You are using a child theme, so your changes won't get overwritten with theme updates. Get the ID of the Beaver Themer Singular Themer layout that you want to use. On the WordPress admin panel, click Beaver Builder (or Builder in Versions before 2.1), then click Edit for the Singular-type layout that you want to use. Make a note of the ID number, which is displayed in the URL when the layout is open for editing. Note: Do not use page- with a hyphen, use page_ with an underscore. Paste the following code into the file. 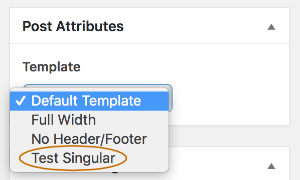 In the third line, replace Test Singular with the term you want to appear in the Template dropdown list. In the fourth line, leave as is for the template name to appear for both pages and Posts, or leave one and delete the other if you want it to apply selectively to pages or posts. In the last line, replace 88 with the ID number of your Singular-type Themer layout. Open a page or post for editing and check for the name of your layout in the Template dropdown list.